Here is a selection from my collection of pedals, most of which I have accumulated over the last 6 to 7 years. I have bought most of them because they were cheap, often in the £25-£35 range. But with the advent of Internet and ebay, the rules have changed. Although it has become easier to find rare or simply old pedals, many of them have seen their price go through the roof and quite often for the wrong reason. A simple "Made In Japan" badge can make young buyers wet their pants in excitement, whereas the Korean or Taïwanese equivalent is often just as good, if not strictly identical. Another consequence is that it is now rare to walk into a music shop and find some good old second hand gear. Ok, stop the rant, start the fun! The Rivera brand is most famous for its very high quality amplifiers. It is offering new effect pedals these days but this one dates back from the 80's. 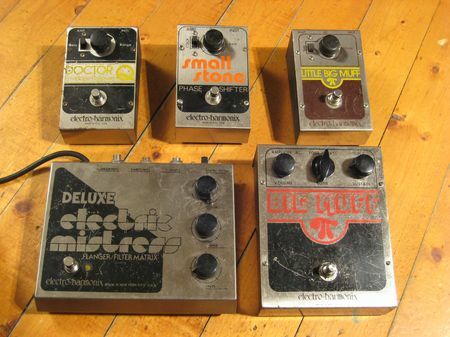 These days boosters, loopers and A/B boxes are quite popular and Paul Rivera was quite a precursor by offering all three functions into one pedal. This buffer came on the market in many disguises: PMP buffer E945, PMG buffer E945, Rivera Buf IV and V. It is battery or mains powered and has a heavy and durable diecast chassis. Rivera also offered simpler versions like A/B boxes or simple loopers, and even used the box for its M-series and S-series amplifiers' footswitches. The circuit of the E945 is very simple with a single op-amp taking care of the buffing and boosting duties, while the loop is post-buffer/booster. The pedal works really well and the amount of ultra-clean boost is quite staggering with an internal symmetrical supply of +/-12 volts. This E945 is ideal with a twin channel Blackface/Silverface amp or with a two amp setup giving a pseudo 4 channel rig with one simple pedal. DOD first series production has seen many variations in colors and lettering. It is hard to find any logic in this changes but here we find the blue, grey brown/red and yellow themes each with its own graphic variant. Chorus is not my thing but this DOD 460 Mini-chorus from the company's first series came with the VOX distortion. It doesn't sound too bad: more Bauhaus than Marillion which in my book is a good thing. It goes nicely with my DOD 280 Compressor and shares the same heavier-than-you-think diecast enclosure. This little grey box can compress your tone to oblivion if you are not careful. With sensible settings, it is quite enjoyable with a strong sonic stamp, a slowish attack and a slightly chaotic sustain that's quite fun. The DOD 201 Phasor is another subtle effect pedal. It is based on the MXR Phase 45 and being only a 2-stage phaser, its modulation is fairly shallow. Nonetheless, it works well on clean tones when a hint of chewiness is needed. The Enveloppe Filter at its side is good but not as crazy as my EH Doctor Q. The effect is always polite, never insane. Good but unfortunately not as good as the hype would make you believe. Last but not least, the YJM308 is not from the first series but it employs the same casing and is a reproduction of the 250, which itself is a copy of the MXR Distortion +. Small variations in component types and values can explain the tone differences between these three models but they all work well as overdrive unit as DOD so rightly states it (and unlike MXR appears to believe). The Wem Copicat is one of the famous tape delays from Europe. 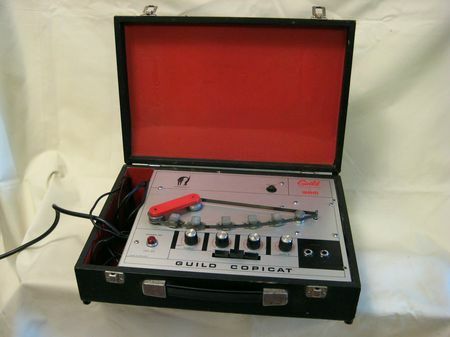 In the USA, it was imported and rebranded by Guild but kept its name and look. This is one such unit that has come back to the old continent. This particular model is a MkIV: one of the simplest transistor types from the large copicat family. It only provides control over the global delay level, the dry signal level (2 inputs), the delay feedback and the selection of the tape heads (3 in total). When I got it, the motor was running but it was still wired as a 110V unit and the electronic was dead. These copicats can easily be converted to 230V so my MkIV was soon up and running. While I always have appreciated the sound of tape delays on recordings, this was for me the opportunity to enjoy the unique tones that even a simple unit like this can provide (much more enjoyable than my Revox B77 configured as a delay). Wether on a clean sound or in front of a fairly dirty amp, the Swell, Gain and Sustain controls allow precise adjustments of the delay characteristics. The tone is not pristine or clinical but manages to remain precise and very natural, whatever the settings on the amp. Playing through the Copicat is simply a very enjoyable experience: it seems to magnify your tone and makes you feel more inspired. 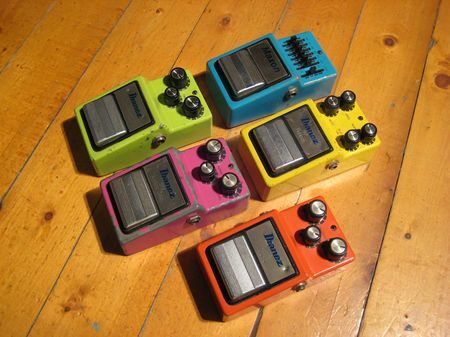 The Ibanez series 5 still hasn't made it to the same iconic status as other Ibanez series of pedals. That is a good thing in my book as these pedals are simply great. Few people know that the series 5 was in fact made of two series. The first one offered metal casing distortion and overdrive pedals in plastic blisters and the second one consisted of plastic pedals in cardboard boxes. This first picture shows 5 of the 6 models of the first series 5. There main drawback is that the on/off switch often develops intermittent faults and that may be the reason why people are selling them off for cheap. The only one missing from my collection is the Thrashmetal TM5, which I have in the plastic form. The following Ibanez Power Lead PL5 is pretty much an MXR Distortion + with a post-equalization emphazising the bass and low mids. It is a very fat and powerful distortion that can almost do overdrive. Great for sweep-picking and legato runs: your hair will curl! The CR5 Crunchy Rythm does exactly what it says. The crunch is fairly bright but with good bass end and can go pretty far. It is quite ear-pearcing into a clean amp but it is quite dynamic and will shine into a slightly distorted amp. The MF5 Modern Fusion is a pretty bizarre slant on the Tube Screamer. The Ibanez marketing guys pretended that it would get you an instant "Fusion" tone with a soft and sustaining distortion. To be honest, it sounds pretty appalling on a clean setting but use it to push an overdriven amp and it becomes one of the best fuzz pedals ever: very fat, distorted and creamy while managing to remain dynamic. It has replaced my SF5 on my pedal board and this is no small feat! The Classic Metal is one of the few pedals from the series 5 that sounds good into a clean amp. It is yet another Distortion + derivative with added bass end and sweeter top end. It provides some good tones from overdrive to big saturation. The second series 5 added all types of effects to the aforementioned overdrives and distortions. Most of them were very good but suffered from the cheap plastic casing and temperamental switch. The TS5 is a bog standard Tube Screamer, very close to a TS9. You should know all about that tone. The TM5 Thrashmestal is a Pro Co Rat derivative but doesn't really deliver in the tone department. It is quite harsh and not very subtle. I guess its name is appropriate! Now here is an interesting pedal: the Ibanez Cyberdrive. It literally is a non-inductor wha (Morley type) in front of an MXR Distortion +, from the second series of the Soundtank pedals. The tone knob controls the wha part. It is possible to get many sounds with just the three controls, from Michael Schenker or Billy Corgan leads, to stoner rock rythm tones (think QOTSA). You can even play some nice funk stabs. The distortion part is very good sounding and responds extremely well to playing dynamics. 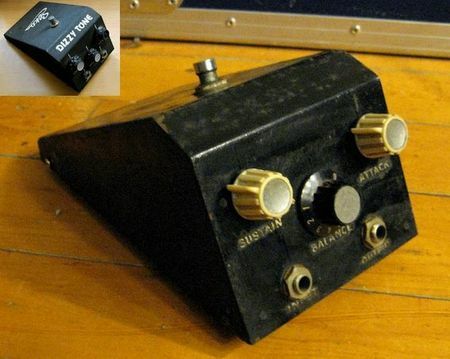 All in all, this is one great pedal that could have been, or could be, a commercial success if it was housed in a sturdy box. The DL5 is your classic average quality digital delay which makes it pretty good as a cheap alternative to an analog delay. It does its job well for slap-back or medium length delays with fairly warm and natural tone. The FL5 flanger is supposed to be a knock-off of the FL9. I haven't verified that but it does sound very close to it. In any case, it is a great analog flanger that can be had for peanuts. These Maestro MPF-1 stompers aren't mine but I wanted to include them as they are pretty rare this side of the pond. Most of all, they are very original items designed by Moog for Maestro. All of the controls can be foot-actuated, even if it is not always very practical. Even the mechanical design is unusual: the whole pedal constitutes the "stomp area" and collapses on its base to actuate the internal footswitch. These are traditional semi-parametric filters, with an unusual selectable overdrive level and this is probably their very best feature. The sound you can get when using them in front of a cooking amp is really very good with great string separation and dynamic range. It apparently is a favorite of Josh Hommes for his signature tone... This is why Geoff from El Gato uses these two! This is not a door-stop but a real effect pedal. It is the Elka Dizzy Tone! 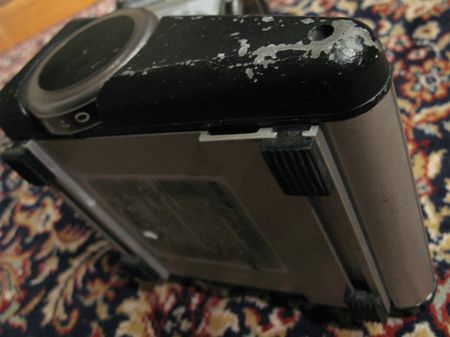 It had a hard life and has lost its logo: even the battery had rusted. It looks quite ugly, and it sounds even worse, but in a good way. 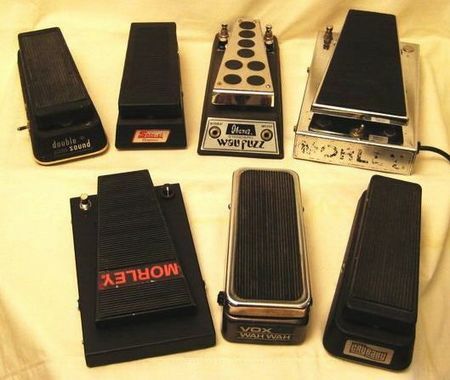 It is actually a relative to the VOX wah pedal below: it comes from Italy and has probably been built by Sola Sound. Its circuit is a straight copy of the Colorsound (or VOX) ToneBender MkIII, germanium transistors included. The only difference is the simpler tone circuit employed here. The sound is great, real nasty, but great. It spits, it crackles, it compresses like crazy and it roars. I doubt anybody could use it for a whole song without losing its audience, but it is excellent in the studio for those times when you need to go overboard with distortion. It also has a great noise gate effect which helps control the beast inside. The green Sovtek pedals seem to attract new fans these days. Here are two of the three available models (the third one being the Bass balls). They were very ruggedly built and came with a cool wooden crate. 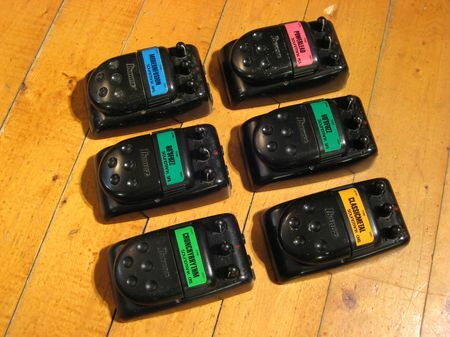 Long awaited in the nineties, these reissues of the most famous Electro Harmonix pedals were cheap. I guess it could be said that they were instrumental in Electro Harmonix's fantastic come back. (Note the difference in green shades and overall construction of the two pedals). Although they are sturdy, the construction isn't top notch with flaking paint jobs, low quality stomp switches, "untrue" bypass, and average quality components. Nevertheless, the Sovtek BMP sounds VERY big and warm (some would a bit muffled) and was an instant success. The black Sovtek versions do sound different but not better or worse. The Small Stone has some very nice phase tones but it is again slightly muffled and therefore doesn't match my 70's EH Small Stone for phasing goodness (see the EH article). One great upgrade that can be performed on these is the modification to true bypass which the original footswitch thankfully allows. 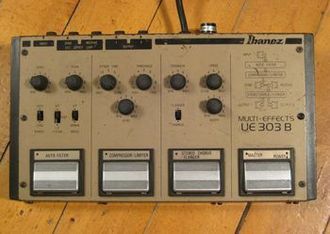 This UE303B is part of the range of three multi-effects processors from the 9 series (along with the UE300 and UE305). 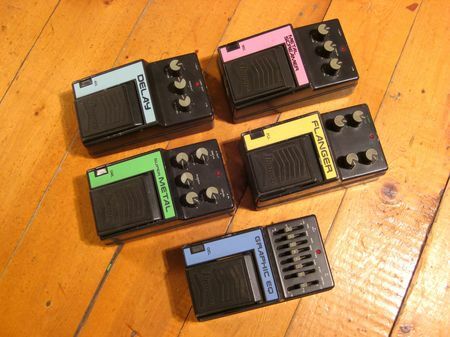 Here we have the auto filter, and the compresseur from the 9 series, and a chorus/flanger. This UE303B was designed with the bassist in mind and was endorsed by bass virtuoso Tony Levin, who is trying to make a comeback these days... Still with a moustache though. This particular exemple does not have its original knobs. Anyway, the auto-filter is particularly cool with wide ranging and extreme effects. It works for bass or guitar with equally good results. The compressor does what it should and the chorus/flanger is quite usable. The flanging side is good, although not as powerful, deep and tweakable as the FL9, which I particularly like. 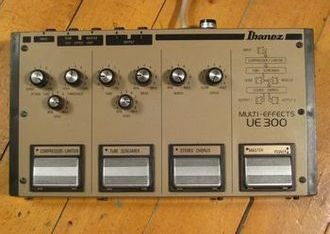 The UE300 was aimed at guitar players with the same compressor that has enough output to overdrive an amplifier, the ultra-famous Tube Screamer, and a chorus based on the CS9. I am not into chorus at all but by setting the BBD clock fast enough with the inside trimpot, it can go into flanging territory. The modulation lacks depth for this kind of effect and there is no feedback control but the tone is good enough nonetheless. There is also an effects loop on these pedals but unfortunately, it is only switchable with the general footswitch: ie. you can't switch it out when any of the three effects is in use. It's a shame because a dedicated loop switch would have made this multi-effects even more usable. 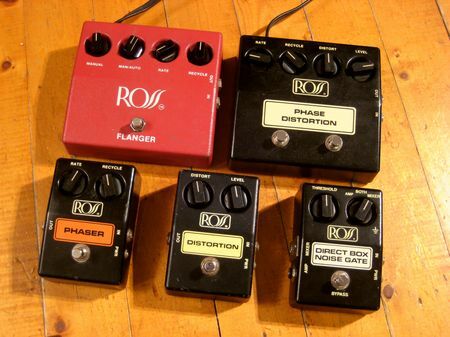 This red Ross Flanger is one of the US made mains-powered pedals of the brand (equivalent Taïwanese pedals are black with a colored square around the pedal name). Like many Ross pedals, this pedal is a copy (not a perfect clone) of the famous MXR equivalent. This particular model uses the now very rare and/or expensive SAD1024 BBD chip. Unfortunately, mine is dead and it looks like it'll probably take a few month (years?) to find another one at an acceptable price... To be perfectly correct, only half of the 1024 is dead since these chips have a tap at the 521th stage. This flanger can therefore flange but not with its majestuous modulation amplitude. The R70 Phase Distortion is another mains powered Ross pedal. 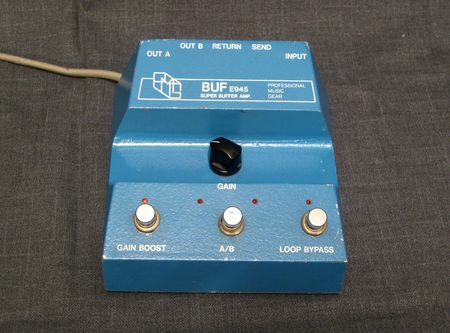 It features the same great phaser as the one described below and a distortion effect similar to the early Ross Distortion pedal. It is an MXR Distortion + knock-off employing germanium diodes for clipping. Its tone is fatter and "hairier" than similar pedals with silicon clipping diodes but it has less output. Therefore, it doesn't work as well as an overdrive on old amps but it actually gives better results than contemporary Distortion + on high gain modern amplifiers like my Soldano SL60. 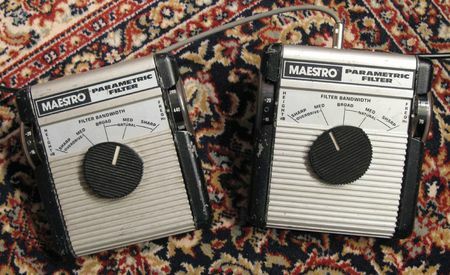 The R70 came in different guises: it was also called "Phaser Distortion" or "D/P Combination" in its US-made pruple version. A great pedal for those who seek a simple plug and play tone experience. 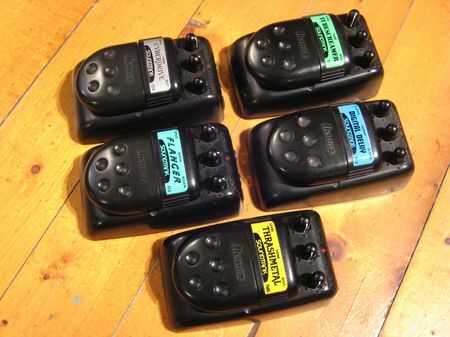 The Taiwanese Ross phaser is not a copy of an MXR and employs an original design using OTAs. It gives classic phasing tones with a good depth and a pleasing modulation that sounds great with clean or overdriven tones. It doesn't have the ringing quality of the MXR phase 90, but that is an advantage in my book. It was given to me by Luke from the Live Music Shop (Peterborough, UK) and has been a mainstay of my pedalboard for 12 years now. On the bottom right, the Ross Noise Gate/Direct Box is just a straightforward noise gate, but for some reason, I like Ross pedals and I got this one for less than a round of beers. Hey, It does its job and that's enough for me! On the Boss side, let's start with the DF2. It is quite uncommon because it uses a monophonic synth that generates a note when you step and keep your foot on it. As the note is related to what comes out of the guitar, it sounds like feedback. Almost. The distortion part is very close to a DS1, so it is not that great. The best thing to do is to restore some mids to the sound and maybe reduce the amount of clipping. I did this mod on a few DF2 for customers so they could have the feedback without the distortion. They seemed quite happy. While the pedal's tone is not very inspiring, the feedback effect can be great fun and it can fool the public in a live context. What can I say about the Boss DD-3? I got this one for almost nothing as it was dead. Its tones are similar to the ones I can get from my Peavey DDL, if only slightly brighter. Its main advantage is that the mix control is very progressive and allows to use the pedal in front of a fairly overdriven amp while still providing enough control on the delayed signal level. The DD-3 is simply a good workhorse. The Boss FZ2 is called Hyper Fuzz because it is based on the Univox Superfuzz. The circuit is "improved" to offer a higher output level, less noise and an additional clear boost mode. The two fuzz modes simply reflect the two tone options of the Superfuzz. The tone of the FZ2 is quite agressive, with a very pronounced upper octave effect. I hated it the first time I tried it because I didn't understand that the best way to use it is to play it like an Octavia. The FZ2 sounds very much like the Ibanez Standard Fuzz or the Superfuzz but with more output and a "cleaner", more modern slant. The two band eq is a great added bonus. It works very well for leadlines and crazy low string riffing. Next we have the Boss FZ3. Just like the FZ2 and FZ5, it sounds as good as a hoover plugged into an 8" speaker when you first try it. But the interesting thing is that a silicon Fuzz Face is at the heart of the circuit. It is therefore pretty easy to mod it into a FF type pedal with an added tone control. To get you started, take a look at my article here in the Tech Talk page. It really can be made to sound great! 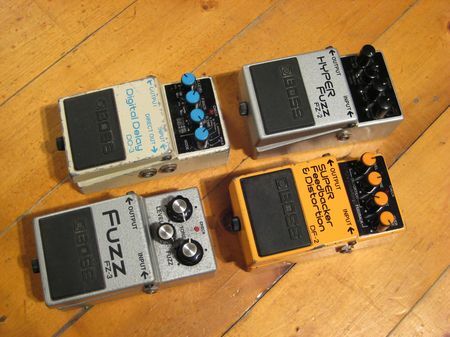 It is amusing to notice that Boss has decided to base its fuzz designs on famous fuzz pedals from other manufacturers. 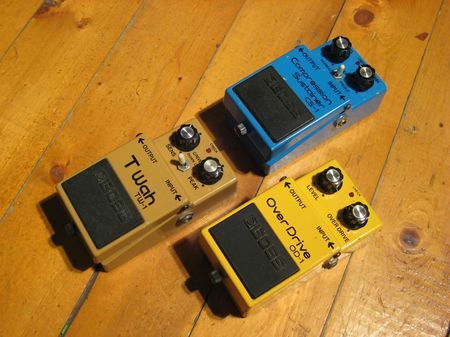 To my knowledge, these are the only Boss pedals of the time to borrow from other manufacturers (apart from the OD1). Furthermore, why not make a fuzz pedal based on the highly collectible Bee Gee and Bee Baa fuzzes from parent company Roland? The OD1 is just a Tube Screamer with no tone pot. It sounds very screechy in its original form but I have an extremely simple mod to counteract this (just one resistor!). It then becomes very warm and pleasant. That's now 7 Tube Screamers in my possession. True, it is a lot, but it is never too much. The CS1 is a special beast. You have to like dirty compression to appreciate it but with the switch in the Hi position, you can sound like Dire Strait pretty pretty easily. The TWha is one great pedal with a perfect tracking, no warbling, and a very good wah tone: there is a cry-baby circuit inside! It doesn't have many controls but what it does, it does well. For the first instalment of the pedals shootouts, we'll start with the good old wha pedal, one of the first type of commercially available effects pedals. There are thousands of types out there, new and old, and I have only included here a selection of the ones I like best. Amongst others, I have omitted the Schaller Wha-wha Yoy-Yoy which despite its funny name is pretty weak sounding (and most often made out of plastic), and my cheap PSK Wha that only becomes useful when you take the time to re-house it and wax-pot its inductor (check out the Colorsound RIng Modulator shell further down). _ The Jen Super Double Sound is electronically identical to the simple "Double Sound". It features a pretty fierce but extremely fun fuzz effect and a classic Vox wha circuit! The wah effect is very clean, very soft and almost natural, if there is such a thing. The pedal throw is a bit short but has a good sweep. It is quite linear with no filter peak like on most standard Cry Babies. This is the wha pedal that reminds me the most of the classic Hendrix wha tones (Axis Bold As Love era) and it is my best sounding wah pedal. _ The japanese Shin-ei Companion Wha is becoming famous as one of the japanese alternatives to the old classic italian and american models. Again, its circuit is that of a standard Cry Baby. It works well but has an ever-so-slightly too short sweep. The tone is good but nothing to write home about in my opinion. All in all, a respectable pedal but not better than your bog standard GCB95. _ The Ibanez Standard Wau Fuzz is one good looking pedal and as a consequence it attracts a lot of buyers. But it's a shame that it doesn't sound so great. The wha is wired in reverse, which is easy to remedy, but the effect is quite simply lame, very shallow and uninspiring. I also have a Wau Wau pedal that sounds just as lame. The pedal feel is also not as good as that of the classic Vox design. The fuzz is quite agressive and can produce octavia types of tone. The Wau Fuzz is fun to look at but it won't make you wail. _ This old Morley Wha-Volume is another great looking pedal. It is mains powered as all of the chrome series pedals. It is based on the famous photo-resistor circuit popularized by Morley. The pedal throw is extreme and you'd better do stretching movements before using it live! The tone of the Wha-Volume is typically Morley with a very long range and fairly soft highs. It can go pretty deep and has a sound more akin to that of an analog filter than to your average wha. This one is very fun to play for special effect or unusual wha parts, but watch that ankle! _ The following Morley PWA's tone is pretty close to its old brother's but the range doesn't go as low. It's circuit is again based on the photocell design and the pedal throw is also shorter which is actually a bit more practical. Again, the tone is more filter-like than wha-like. It works well for bass or keyboards but you have to get used to it for guitar. As far as I am concerned, the position of the footswitch on the side of the pedal isn't particularly suited to live use so this one won't go on my pedalboards. _ This VOX branded Sola Sound is a true VOX wah but it is strictly identical to the 70's Colorsound wah made famous by Mark Thompson in his Guitar Player pedals shootout back in 92. It is not the Sola Sound design that works without an inductor but it bears the more traditional circuit. This is a great sounding pedal, true to the American magazine's article. It has quite a long throw and limited output but it is extremely vocal and sweet sounding. I like it very much but I consider my Jen Double Sound to be even sweeter. The tones are comparable but the sweep of the Vox isn't as linear as the Jen's because of the mechanical cam design used here. _ The good old Dunlop Wha GCB95 closes this shootout. It is the most popular model of all wha pedals, although it has seen many evolutions as far as the circuit, the circuit board and the components quality is concerned. It has a definetly classic tone and sounds great for leads with a mids peak in the middle of the sweep that some love and others hate. While not the best wha pedal there is, it is the most common one because it sounds good and it can be used efficiently for all styles of music. It is also very sturdy and this is very important for a wha pedal! The great looking Guyatone Driver Box is an almost straight copy of an MXR Dynacomp. The same mid emphasis is perceptible: great for a bit of country music. It really is a great compressor that makes you want to play. What sets these Guyatone pedals apart is the use of very cool looking knobs that look like miniature versions of vintage Orange amps knobs. 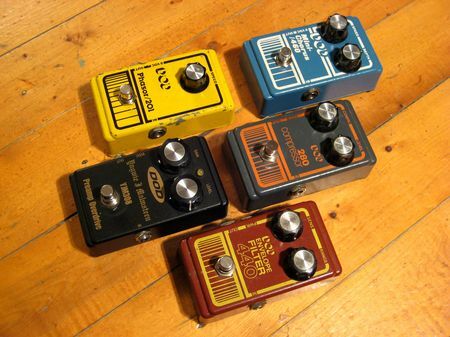 The Rolly Box from the same Guyatone range is not a copy of an MXR phaser. Its tone is nevertheless very interesting with a deeply-notched modulation that's extremely wide and chewy. It is great for special effects or for your daily slice of Stoner Rock! 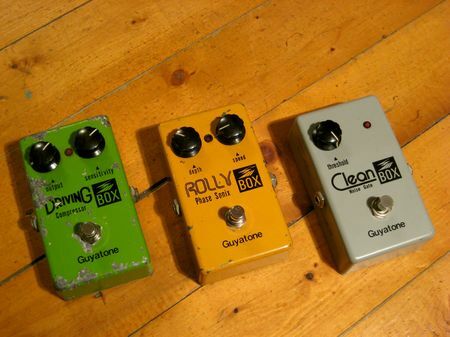 The last Guyatone pedal is the "Clean Box". It is in fact a noise gate which circuit is taken from the MXR equivalent. While it certainly does its job and is fairly transparent, it only works well with vintage-style levels of distortion as it doesn't offer extensive control on the gate's behaviour. This particular exemple is physically extremely clean indicating that it hasn't been used much in 30 years! There isn't much more I can say about the TS10 that hasn't been said other than that I really appreciate the 10 series: cheap, good sounding, resilient and disregarded by most hyped-up guitarists listening with their eyes. Thanks for that! As you might have guessed, I particularly like the TS10 over the TS9 as it's mid peak is voiced lower: it suits me perfectly. I also like the CP10. It is a Dynacomp derivative with a different OTA and a more transparent voice. It works well and constitutes a nice alternative the MXR standard. Some says it robs some bass: I don't find that a problem when the signal is compressed as it is very subtle and brings clarity more than anything. The Fat Cat (dark green) is in fact a RAT with a different voicing. I got this one in Buenos Aires and liked it so much that I converted my Pro Co Rat to Fat Cat specs. Try it in front of a clean Bassman and you'll understand why. It can do mild overdrive, distortion and all-out fuzz. Great stuff. The LM7 is quite the opposite funnily enough. It is the only pedal of the range to bear the number 7 (go figure), and it sounds pants. It is based on the Fat Cat and the circuit board is strictly the same (the reference is even FC01!). It only lacks the clipping diodes and has a slightly different voicing. I probably shouldn't divulge it, but by simply replacing the op-amp with a J-Fet model, the sound improves ten-folds and the pedal becomes a usable fuzz box. The DL10 is just a good honest digital delay. It is cleaner than an analogic one but smoother than a modern digital unit thanks to its low digital specs. It is very good if you use your delays before your amp and not in the effects loop. These two dinosaurs are from the first series of the Ibanez pedals. The missing one is the famous Standard Fuzz whoch has two sliders for control. 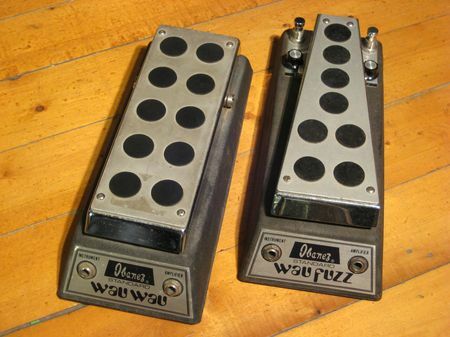 The Ibanez Standard Wau Fuzz and Ibanez Wau Wau are good looking pedal and they attract a lot of buyers because of that. It's a shame they don't sound so great. The wha is wired in reverse, which is easy to remedy, but the effect is quite simply lame, very shallow and uninspiring. The fuzz is quite aggressive and very similar to a Univox Superfuzz. The two tone options given by the footswitch are good alternatives but don't change the character of the distortion effect. It isn't bad for crazy lead parts, but it is simply unusable for most rythm duties. The Ibanez Standard Fuzz circuit is very similar, so buyers beware: the pedal looks good but try it before you buy! On the top left, we have the ADL delay. It is an exceptional delay pedal as far as I am concerned. It shows all the qualities of a great analog delay, without the downfalls. The tone is as clean as can be for the technology, warm but not mushy, and is truly addictive. It is definetly as good as the Maxon AD999 which for me is a reference, and it only lacks its extended delay time. As you have probably noticed, I am an Ibanez FL9 enthusiast and this Ibanez FLL isn't bad either. It has exactly the same control layout, but it doesn't have the depth of its older sister. The swoosh is slightly higher pitch but what it lacks in that department is made up for it by the intensity of the "swoosh". In other words, another great flanger! The Super Metal is said to be an exact replica of the sought after SM9. It definetly lacks its fantastic metallic blue shade and as far as i am concerned isn't a great pedal for guitar. While the produced tone could be qualified as old-school metal, it isn't really inspiring. It doesn't lack sustain but has no dynamics to speak of and the highs are a bit too abrasive. Anyway, it works pretty well forfuzzy bass tones. The Ibanez Metal Screamer is one good sounding pedal. Contrary to what its name suggests, you won't get "metal" levels of distortion as it is only a slightly modified TS9. With just one component change (the cap going to ground in the first op-amp stage feedback loop), this pedal offers a bit more bass and mids than your standard Tube Screamer. So it is one of the first modified TS ever produced, long before all the "boutique" business. I like this pedal when playing with single coils but since I always use my overdrives in front of a crunching amp, I still prefer a TS10 with humbuckers. The bass cut is needed to avoid mushiness in the sound with them. And you still have plenty of bass end because of the compression effect of the amp. The graphic EQ of the Ibanez L series employs the same circuit as the GE-9, although the circuit board is different to accomodate the shape of the pedal. Just like its big sisters (the GE-9 and the GE-601), the GEL does what it is supposed to be and it is quiet enough for most guitaristic uses. 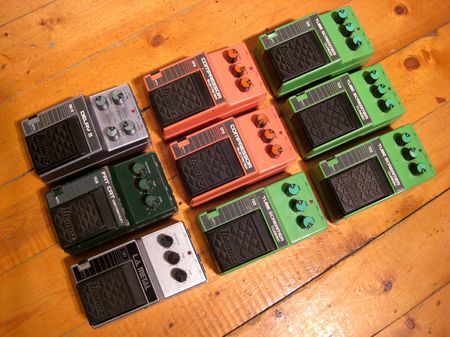 Ibanez series 9 pedals are good, roadworthy effects. The FL9 is my favorite of the lot and is as good as the Electric Mistress: this is why I have two! You can freeze the sweep for a "filter matrix" effect and the "swoosh" really stands out of the mix. The fact that it is much more compact and practical than the Mistress makes it ideal for live use. You'd be forgiven for thinking that this Maxon GE-9 uses the same circuit as the Ibanez GE-9. But this model form the 80's uses the circuit of the already reviewed and earlier Ibanez GE-601. It does its job well, like pretty much all guitar dedicated graphic eqs on the market. But this one somehow managed to re-ignite my interest in these pedals. While toying with it, I reproduced the response curve of my trusty Tube Screamers and I discovered that I could get a very similar overdriving effect, but without the inherent compression of the TS. This made my tone clearer, with more definition and attack, while simultaneoussly not introducing more highs. I never thought I'd play a gig without my good old Tube Screamer but it looks like I will very soon. And it was so simple! Why didn't I think of that before? The AD9 is one of the holy grails of delay pedals, at least according to what's on the web. It does sound good and shares all the qulities of the 9 series, but I can't help preferrring my cleaner Ibanez ADL. The AD9 tone is fairly grungy and dark and will get you all these self oscillation noises, and that's exactly what one looks for in an analogic delay pedal. The color is great too! The PT9 phaser is a fairly high-pitched phaser. It's seems that it has a more of a "head voice" rather than a "tummy voice". It is musical and enjoyable but doesn't sound like your average phaser. The SD9 Sonic Distortion is another sought after Ibanez pedal. It is a not so distant cousin of the Boss DS1 and as for this orange stallwart, I am not so thrilled about it. It lacks output and mids which makes it ok for bedroom use but not so much for live use. Ah well, who said the majority was always right? Ever since I tried a 70's Electro-Harmonix Small Stone in the Live Music Shop (Peterborough), I always wanted one. But I wanted one cheap.... And I finally found it. Its tone is close to my Sovtek version (see below), but it has a shimmering high end that the Russian one lacks completely. Switch it on after a fuzz and it is instant Billy Corgan in the Gish or Siamese Dreams albums. I simply love it! My love of Big Muff Pi won't go unnoticed. 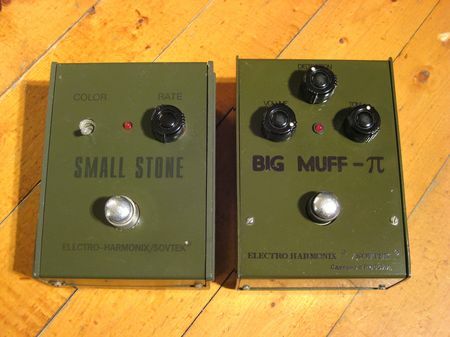 There are only 2 here, with one of them in the form of the original Little Big Muff (there is another one on my pedal board). Both of these versions are of the "opamp" type, meaning that their tone is different from the original BMP transistor type. It is nevertheless not so distant and actually has my preference. Both pedals use the exact same circuit board. In their original state, LBMP are unusable: the two position tone switch goes from one extreme of a Big Muff Pi tone pot to the other. In other words, its either muffled or extremely shrill. I have a set of mods that I developped on the BMP and I have applied it here: I am quite proud of the result (I used the LBMP on two of the Poncharello "Tune In" album). The Doctor Q is one funky mofo with a quite a dirty but approrpriate sweep. This one dates back from the 70s but the first reissues are just as good: the circuit is very simple with no mojo parts. The Electric Mistress (again from the seventies) is one of my favourite flangers. It can nail many different classic flange tone without the gurgle that in my opinion plagues MXR flangers. Use it in a stereo rig and you are in flanger heaven. The filter matrix mode is definetly a plus here for those extreme metal tones or for overdubbing (ask Mr Corgan).